Members, if you sign in Guests, please see that they obey the rules, the same as we do, and remember, you are responsible for their conduct and safety. The rules are as follows and will be strictly enforced. Please share them with your family and any guests that you may bring. 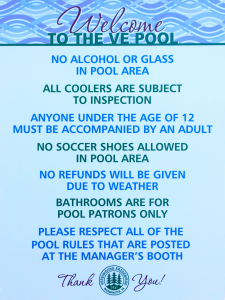 All persons patronizing the VE Pool will be expected to follow these rules. The summer season is now approaching, and “Waldesrauschen” will be the center of increased activities and this, of course, will put a tremendous task upon those members who are responsible for keeping our grounds in excellent condition. This is possible only with the help of all our members, and we appeal to every member to give us the fullest cooperation in this respect. Parents, please instruct your children to comply with our Club Rules and Regulations as you, and only you, will be held responsible for the behavior of members of your family while anywhere on Club property. Always use receptacles for any waste and see to it that children follow your example. We are very proud of our trees and shrubbery, please do not damage them. Always have your membership card ready to show upon request of the cashier at the pool entrance and follow his/her directions. Swimming is for members only at their own risk. Members and/or their children age 12 and older may sponsor guests for the privilege of using the swimming pool and MUST ACCOMPANY THEM TO THE CASHIER FOR REGISTRATION. Donation for guests to be paid by the member (or their children age 12 and older) according to our payment schedule. To safeguard health and to maintain a sanitary swimming pool, it is imperative that each person shower before entering the pool. Adhere strictly to this rule and instruct your children and guests to do likewise. Children wearing diapers are not permitted to use the large pool, they are to use the baby pool. Only children UNDER the age of 6 are permitted in the baby pool and must be accompanied by an adult at all times. Children under the age of 12 cannot be admitted without older supervision. Children may only use life vests in the shallow end of the main pool. Other flotation devices and toys may be used in the shallow end during playtime ONLY. The Club will not be responsible for damage to automobiles parked on Club grounds or for the loss of personal property. Parking in the rear of the swim hall will be permitted only to those with a Pool issued parking permit. This regulation will be strictly enforced. Bicycles must be parked at the bicycle rack at your own risk. Motorcycles are not permitted at the pool area at any time. Infants/toddlers in either pool must wear swim diapers. USE OF REGULAR DISPOSABLE DIAPERS IS PROHIBITED (check with the manager if you have any questions). Use of the baby pool shall be limited to children under SIX (6) years of age, and they must be accompanied by an adult who will be responsible for their conduct and safety. not allowed. Diving from the apron on either side of the diving board is prohibited! Bikes may be parked in the bike rack at your own risk. THE ENFORCEMENT OF THE RULES IS ENTIRELY AT THE DISCRETION OF THE LIFEGUARDS AND MANAGERS ALONE. ARGUING WITH OR SHOWING DISRESPECT IN ANY WAY TO ANY POOL PERSONNEL MAY RESULT IN IMMEDIATE EXPULSION FROM POOL GROUNDS. THE LIFEGUARDS ARE IN CHARGE AT ALL TIMES. THEY HAVE THE AUTHORITY TO TAKE ANY ACTIONS NECESSARY TO INSURE YOUR SAFETY AND THE SAFETY OF THOSE AROUND YOU. THEIR DECISIONS ARE FINAL AND ARE NOT SUBJECT TO DEBATE. The Pool Chairperson and Managers reserve the right to make any changes to the Pool Rules and Regulations at any time as deemed necessary in order to ensure the safety and well-being of the members and their guests. THIS DECISION IS FINAL. NOW IS THE PERFECT TIME TO JOIN THE VE POOL! Just $530 gets your family a VE Pool membership.